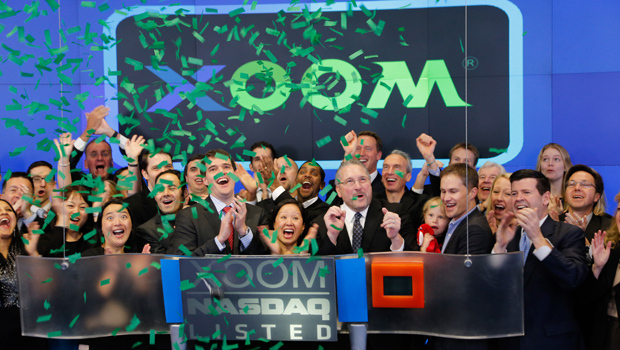 NEW YORK Shares of Xoom (XOOM) soared more than 40 percent in their first day as a publicly traded company. The online money-transfer company gained $6.41, or 40.1 percent, to $22.41 in midday trading on Friday. It opened at $21. The banks managing the deal may buy nearly 950,000 additional shares to sell if there's demand, increasing Xoom's proceeds from the initial public offering. Xoom, an upstart Internet competitor to Western Union (WU), sold 5.2 million shares in the IPO, while early investors offered 1.1 million. The company won't receive proceeds from shares sold by the early investors. It predicted proceeds of $74.7 million after expenses, which it expects to use to run the business and possible acquisitions. Xoom says many of its customers are immigrants to the United States that use Xoom's website to send money back to people in their home countries. They transferred $3.2 billion last year, up from $1.7 billion in 2011.